Kevin Durant proved to all his fans that he's still the main man of his team as he carried the OKC Thunder against the Memphis Grizzlies in their game 7 showdown held in their home court. He scored 39 points en route to beating the Grizzlies, 105-90. They've entered the Western Conference Finals and they will face the daunted Dallas Mavericks that swept the Lakers in 4 games. Durant revived himself from a very poor performance in game 6 wherein he only scored 11 points. He started hot in this game 7. He only had 25 shots but he had 39 points. That's how you measure a person. He never stops until he improves game after game. He just helped his team enter the finals which they haven't experienced since 1996. "I just attacked. I was so upset with myself for letting my guys down by not playing my game (on Friday). I wasn't aggressive at all. But I stayed with it. I was just positive and confident and kept the faith in the things that got me here." Nick Collison, the hard worker of OKC drew several offensive fouls including one against Zach Randolph. Zach Randolph had a hard time in penetrating OKC's several line of defense with Nick Collison as their vanguard. Also, James Harden exploited Memphis' defense. He had 17 points off the bench which was highlighted by 3 three-pointers. "I guess I can say it now: He stunk last game. But he doesn't take anything for granted, so I knew he would come back and have a fantastic game." But here's the catch about the Grizzlies' amazing peat this year wherein as an 8th seeder, they made a great run for the Western Conference Finals without their ace player Rudy Gay. Their peat marked the beginning of a new era for the Grizzlies. The Grizzlies were already the only No. 8 seed in West history to win seven games in a single postseason, besting the previous high was six by the 1993-94 Denver Nuggets, and were just a win away from becoming the first eight seed to reach the conference finals. The Western Conference Finals will start on Thursday, Wednesday here in the Philippines. 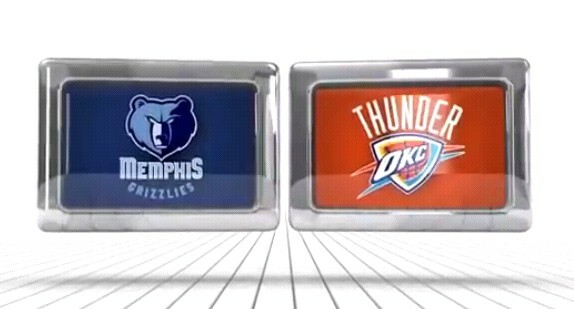 Here's the Memphis vs. OKC game 7 replay video highlight from YouTube.